Is it really expensive to be a vegan? I’m a vegan of almost 6 years, and one question that I consistently get asked has to do with my grocery budget, “Isn’t it expensive to be a vegan?” and the answer is always “no.” People always seem to be concerned with how much I spend on food each month and for some reason it’s assumed that a vegan lifestyle goes beyond that of a traditional food budget. Of course, this isn’t the case, but I’d like to explore this a bit deeper with you today. If you’re not sure what the difference is between vegan and vegetarian, let me explain. Vegetarians do not eat meat or meat products. Vegans do not eat meat, or any animal products; that includes: dairy, animal byproducts (like gelatin), and sometimes honey or beeswax (depending on your preferences). The main difference is that vegans do not eat any dairy: no milk, cheese, sour cream, cream cheese butter etc. With that aside, let’s take a deeper look into the financial side of veganism, where the misunderstanding came from, and what a standard grocery budget looks like. Many individuals have the misunderstanding that vegans have to make up for all the nutrients they must be missing out on, which is of course not true. Vegans should be cognizant of the types of foods they are eating in order to maintain a well-balanced diet. Eating a healthy amount of leafy greens, beans, legumes, grains, fruits, and vegetables are all equally important. Of course, if you don’t keep track of your diet and eat well-balanced meals, you could end up lacking in certain nutrients and minerals. It’s hard to say exactly where the idea that veganism is expensive originated. 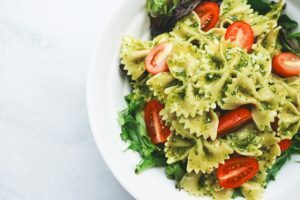 Sometimes when people think about vegetarianism or veganism, they assume that non-meat eaters must buy a lot of specialty products in order to have a well-rounded diet. In other words, in order to have a “normal” diet, you have to fill it with luxury items or additions to your diet in order to be satisfied. However, the idea that vegans need to eat more food in general in order to “make up” for the loss of nutrients is simply false. There are so many great foods out there in the world, that are not processed, and happen to contain just as many essential nutrients (like iron and protein) that meat does as well. We’re talking about the foods listed above that everyone eats, like beans, oats, seeds, nuts, and fruit. Why are Some Vegan Foods More Expensive? I should say that there are many luxury items available to vegans and vegetarians these days. There are meat and dairy alternatives galore! Almost anything that you can think to eat as an omnivore, we have meatless and dairyless options available and sometimes those options do tend to be more expensive than the alternative. That is simply because alternative products have to be used in the production of the food. For example, if you were going to make a vegan jello, you couldn’t simply add gelatin in order to make it have the same texture as traditional jello. Gelatin is derived from the gelatinous parts of animals that are usually leftover after butchering, so a vegan would need to find another ingredient instead. Agar-agar is a great jello alternative made from algae. However, that ingredient isn’t mass produced like gelatin is, which means it is commonly more expensive to buy than gelatin. With that being said, you can understand that certain alternative ingredients are more expensive than those that might come along with a omnivorous diet. However, most of these are not essential to a vegan or vegetarian diet. They are simply for when you want that extra indulgence or treat once and awhile. What Should Your Grocery Budget Look Like? Americans spend on average about $330 on groceries each month. Personally, I’d say that I spend anywhere from $200 to $300 each month on groceries, which is right in line with that national average. Of course, financial experts say that we’re all spending too much on groceries, whether we’re vegan or not. In a perfect world, it is said that you shouldn’t spend more than 15 percent of your paycheck on food. This means if your household annual income adds up to about $50,000, you’re looking at a $625 maximum monthly budget on food. This also includes meals purchased outside of the home, not just groceries. However, with a budget like that, it would be easy to set aside $300 to $400 for groceries and still have plenty left for days when you don’t feel like eating at home or bringing something from home for lunch. What Kind of Food Should I Buy as a Vegan? The answer to that question is completely up to you. No one should ever tell you what kinds of foods you should buy or not buy. If you choose to indulge in some of those extras we talked about earlier, you have every right to, just as anyone else would. However, the idea that veganism is inherently more expensive than a “normal” diet is completely untrue. Any vegan out there can attest to the fact that we can buy groceries each month according to a budget just like anyone else can. Again, speaking from personal experience, sticking to a budget is quite easy for me. In addition, I’m usually making home cooked meals about five nights per week. Pasta, soup, burritos, chili, burgers, pizza — you name it. These are some of my favorite things to make from scratch (or mostly from scratch) on the regular. I do my best to cook with wholesome ingredients that have little additives, and I also try to stay away from too many processed foods (like faux meats). A little bit every now and then is okay for me, but I don’t like to eat processed foods with every single meal if I can help it. All in all, I’d say that I have a fairly normal diet for the average American twenty-something, and as a vegan I’d say that my food budget is doing just fine. The idea that vegans and vegetarians have to pay more in order to fulfill their lifestyle choice is a complete myth. If you’re thinking about going vegan or vegetarian, you can absolutely do so with the same exact food budget that you’re working with right now. As of 2017, about six percent of the American population identifies with a vegan lifestyle. That equals out to almost 20 million people! It’s safe to say that veganism isn’t just a trend and we’re in this for the long haul. We’re doing what we can to help the environment, protecting the lives of animals, and saving the world’s resources — and you can too!